Joint problems are common in older cats. If your kitty is suffering from joint pain or stiffness, it's essential to uncover the cause as soon as possible. Rheumatism in cats has many potential causes, each with a different treatment and prognosis. Your vet is the only person who can get to the bottom of your kitty's symptoms. Rheumatism is a non-specific term for a variety of disorders and conditions characterized by inflammation, discomfort and limitation of motion in the joints and related structures. It is not a single disease and may be localized or generalized. Although the term is currently out of common use, it may be used when an official diagnosis of arthritis or degenerative joint disease is uncertain. Symptoms of joint problems in your cat may be subtle or significant. In some cases, reclusive behavior and reduced interest in play and activity may be the only signs something is wrong. Other times limping, loss of mobility and joint pain may be obvious. Your cat may have trouble stepping in and out of her litter box or climbing onto the window sill. Plus, pain during movement may start to interfere with grooming, sleeping, eating and defecating. 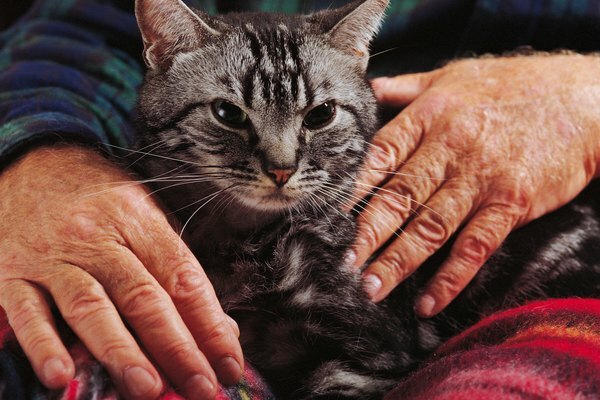 Treating rheumatism in cats depends on the underlying cause of the problem. Often joint damage is irreversible and treatment focuses on making your cat more comfortable and improving her quality of life. Supplements containing glucosamine, chondroitin, omega-3 fatty acids and other ingredients are available to improve joint function and ease stiffness, and stronger pain relief is available by prescription from your vet. Encouraging activity, when possible, will help minimize stiffness. It will also promote weight loss in overweight cats, which in turn will reduce pressure on joints. If your kitty is having trouble getting around, consider placing her food bowls at a comfortable height and provide a soft place for her to sleep that is partially hidden. Experiment with different litter pans until you find one your cat can get in and out of easily, and help her onto your lap or other high surfaces. Also, remember that pain and loss of mobility may be affecting her mood, behavior and ability to use the litter box. Be patient with your pet. Medical News Today: What is the Difference between Arthritis and Rheumatism? Cornell University College of Veterinary Medicine: Is Your Cat Slowing Down?